WASHINGTON, D.C. – Last night we lost an American hero. On the day we celebrated the life of Dr. Martin Luther King, Jr., we said goodbye to Harris Wofford. 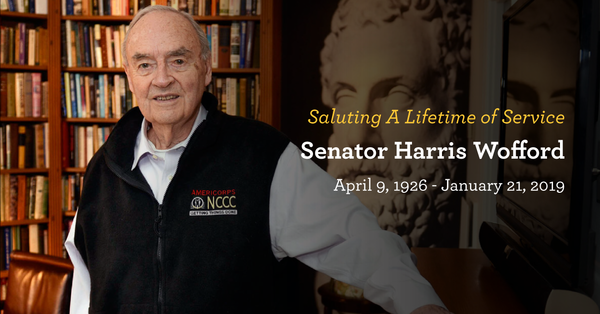 Harris was a tireless champion for national service, a patriot who loved his country, a beloved friend and mentor to many, and a guiding light who called us to serve and lifted our sights to achieving America’s promise for all. For seven decades, Harris served his country. He enlisted in the Army Air Corps in World War II, worked with Dr. King, advised President Kennedy on civil rights, and helped launch the Peace Corps. He represented Pennsylvania in the U.S. Senate from 1991 to 1994 and served as the CEO of the Corporation for National and Community Service (CNCS) from 1995 to 2001. After leaving office, he continued to bring energy and passion to national service and other causes, working across party lines to find common ground. Harris understood the secret heart of America and the secret to our success: the idea that it is better to serve than to be served, more blessed to give than to receive. He believed – like Dr. King – that everyone had the power to make a difference, and that all should be engaged in building a better society and help fulfill the promise of America. From working to pass the legislation creating CNCS, to expanding service opportunities in AmeriCorps and Senior Corps, to his leadership on volunteering and service initiatives outside government, no other American has done more to advance the cause of citizen service than Harris Wofford. CNCS and the larger national service community will deeply miss Harris and are honored to carry forward his vision and work every day. Our heartfelt sympathies are with his family and his loved ones. As we remember and celebrate his extraordinary life, we must also redouble our efforts to expand opportunities for Americans to serve. While Harris made an extraordinary impact that touched millions of people’s lives, he would be the first to say we have much more to do to make service the common expectation and experience of every American, to “crack the atom of civic power” and unleash it to solve our nation’s challenges. May Harris Wofford rest in peace. But may the rest of us fight for the ideals he stood for, and carry them forward through our own acts of service to our communities and country. The Corporation for National and Community Service is the federal agency for volunteering, service, and civic engagement. The agency engages millions of Americans in citizen service through its AmeriCorps and Senior Corps programs and leads the nation's volunteering and service efforts. For more information, visit NationalService.gov.